(MENAFN - Khaleej Times) Visitors at Gitex Technology Week this year can experience live 5G experience, download 4K HD video content, even witness the future of mobility with the world's first flying car Pop. Up Next to make a presence on the Etisalat stand. Etisalat on showcased live download speed comparison between 4G and 5G live networks giving visitors a chance to experience the "download time" difference between the two technologies by downloading a 4K HD movie/video using 4G and 5G simultaneously. The 5G use case that will focus on ultra-high speed and low latency. The exhibit will highlight the comparison of time to download a 4K video using 4G and 5G technology. The video(more than 1GB) download time is taken only 13 seconds as opposed to 4G, which takes approximately 2 minutes. The download progress will be displayed on the screen to show the time taken to download the file on each technology. Visitors will have a chance to observe the time taken to download a large size file on 4G and 5G concurrently. Saeed Al Zarouni, Senior Vice President, Mobile Network, Etisalat highlighted: "This year our participation at Gitex Technology week is significant as visitors can experience live 5G giving them a preview of the digital future. Etisalat has also taken the lead in 5G this year and this showcase is a testimony to our long-standing efforts in bringing growth and innovation in the country laying the foundation for smart city development. "The showcase is also in line with our main theme at Gitex this year 'Leading the 5G Revolution' and 'Driving the Digital Future to empower societies'. We believe 5G technologies and services will deliver capacity and connectivity along with opportunities for economic growth, education, healthcare, transportation and more." This year at Gitex, Etisalat also has a special showcase on the future of mobility, which is the best use case for 5G. The arrival of 5G technology will allow faster data transmissions and will prove to be game changing for the autonomous industry. The flying car "Pop.Up Next" is for the first time making its presence outside Europe, it is the first fully electric and zero-emission modular system bringing together road mobility and air transport. It combines the flexibility of a small two seater ground vehicle with the freedom and speed of a vertical take-off and landing (VTOL) air vehicle, thus bridging the automotive and aerospace domains. With IoT gaining popularity and the use of cyber-physical systems and advanced analytics to transform all aspects of the industry, Etisalat has also displayed tactile internet use cases where the robotic system is controlled remotely using the 5G technology. Tactile internet enables humans and machines to interact with their environment, in real time, while on the move and within a certain spatial communication range as well as enables haptic interaction with visual feedback. These 5G powered tactile production systems showcased for the first time support increasingly flexible production lines and safer working environments that will allow industry to enhance productivity, and respond to customer needs, as they continue on their digital transformation journey. 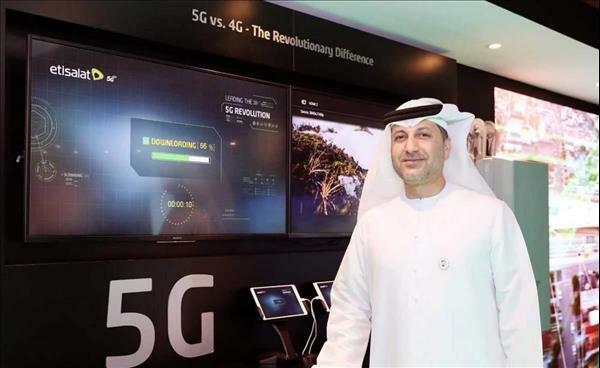 Recently Etisalat also announced a major milestone with Expo 2020 Dubai becoming the first major commercial customer in the MEASA region to access 5G services. Etisalat's network will provide the most advanced digital and telecom services to Expo 2020 Dubai and its millions of visitors, supporting an expected 300,000 daily users on peak days. Etisalat was also took the lead to launch the first commercial 5G wireless network in May 2018 becoming the first telecom operator in the Middle East and North Africa (MENA) region to achieve this technological milestone and set a industry benchmark. Etisalat will also have a fully developed commercial 5G network available to provide gigabit internet services to its customers. The network will fuel enterprises digital transformation, IoT, smart cities and the fourth industrial revolution. The foundation of this commercial launch was laid in December last year, where Etisalat was one of the operators globally to launch a pre-commercial 5G network in certain areas of the country demonstrating high-speed use cases in addition to the low latency feature of the 5G technology. Etisalat also demonstrated an advanced 5G based drone equipped with a 360-degree VR camera and 4K streaming experience. 5G technology will have speeds of up to 20 gigabits per second, as much as 30 times faster than 4G, the highest in mobile data technology. 5G also promises to have 10 times lower latency comparing to 4G. 5G will make 4K/8K video streaming so fast that they become real-time. Visitors will realize how easy and super-fast the download is over 5G network compared with 4G.